Even though I’m a big football fan and I love a good game (especially when my team wins), when it’s over, it’s over. Whether the outcome of the game is favorable or unfavorable, life goes on and so do I. So football is finished until next year, but eating happens multiple times a day everyday. And today I am much more focused on what to do with Super Bowl leftovers! Quinoa cornbread became breakfast. Chili went into thermoses for lunch. And topping bar items can make their way into frittatas, quesadillas or soup for dinner. 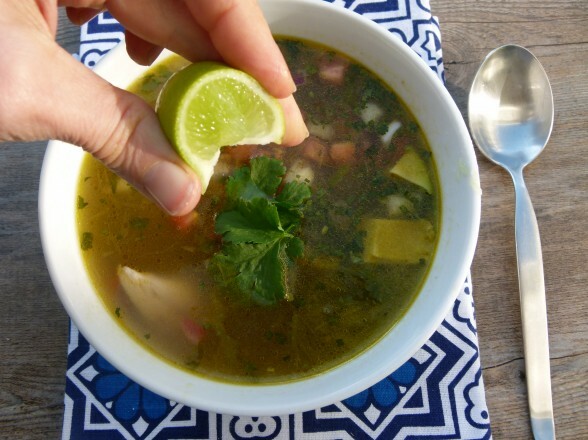 This particular soup was not my brain child, but as often happens in my life, my kids leave the house and are amazed by what they’re “missing.” A while back my mother-in-law took them to Cafe Rio, a “fast casual dining establishment,” and they went bonkers for the Tortilla Soup. It’s is a brothy and flavorful chicken stock-based soup with some vegetables and whatever add-ins you choose. Whereas the younger two kids asked me if we could go there for dinner some night and have it again, my older daughter knew me better than that and suggested I try to copy the soup at home. Great idea! So one day my friend Cheryl and I went on a secret reconnaissance mission to the local Cafe Rio to check out the famous soup and see exactly how they do this thing. Truthfully, their method is pretty genius and it’s the perfect soup to make at home for a family or a group. 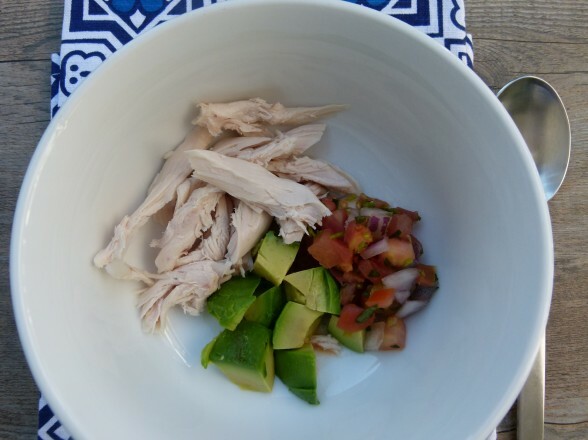 The server adds into a cup your choice of chicken, guacamole, salsa, cheese, cilantro, and tortillas, and then ladles a flavorful chicken soup on top. Yep, that’s it. And except for being unbelievably salty, the soup was rather tasty. You know how much I love a do-it-yourself situation (less work for me!) Can you picture how easy this is if you have cooked chicken and salsa already made? This comes together in minutes, I tell you, and everyone makes it the way they want. You want it to be vegetarian? No problem! Just sub a great vegetable stock for the chicken stock and add in some pinto beans for protein. Even though my intent was to copy Cafe Rio’s soup, I ended up making a couple of my own tweaks, such as using chopped avocado instead of guacamole (but definitely use the guac if you have it) and adding a squeeze of lime at the end. I used poached chicken the day I took these photos and give you directions for that in the recipe, but I have used leftover grilled chicken or the meat from a whole roasted chicken, too. And sometimes I add quinoa to mine if I’m not in the mood for chicken, and I love that, too. But the method behind this soup is giving me all sorts of ideas for how to use up some tasty leftovers. If you make the soup base as directed here, I have chopped up leftover enchiladas and added them for an “enchilada soup,” but I bet you could add in taco meat and some tortillas for a “taco soup.” I’m excited by the possibilities, plus I think I just made my meal plan for the week! Poach the chicken: Place the chicken breast, onion half (halved again), salt, pepper and garlic into a medium saucepan. Add enough cold water to cover the chicken. Bring to a boil over high heat and lower heat to a simmer. Simmer chicken for 25 minutes. Remove from heat and allow chicken to sit in the liquid until cool enough to handle. In a large pot, warm the oil over medium heat. 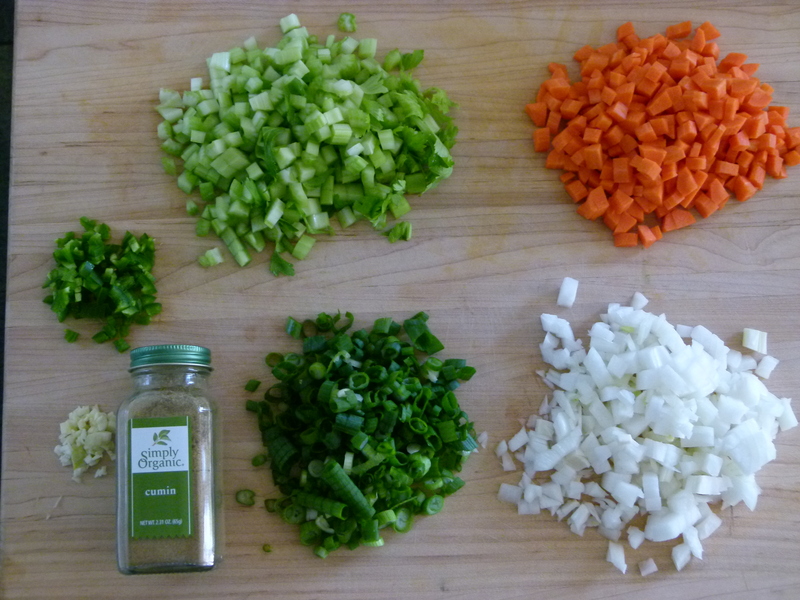 Add the chopped onion, scallions, carrots, celery and jalapeno. Sauté until onions are tender, about 5 minutes. Add garlic and cumin and cook for 1 minute. Add the chicken stock, salt and pepper and bring to a boil. Lower heat and simmer until carrots are tender, about 4-5 minutes. 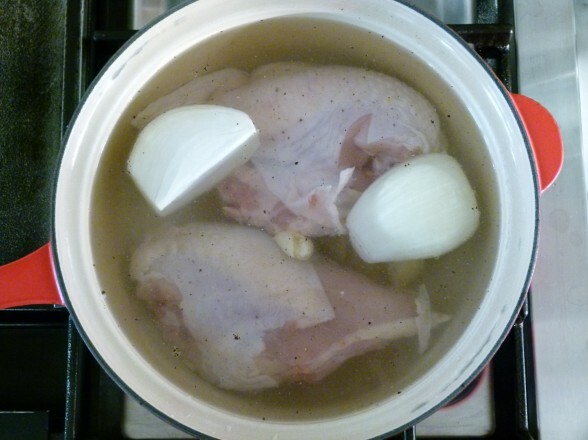 Pull chicken from liquid and remove skin and bones. Shred chicken into bite-size pieces. You can divide chicken amongst the 6 individual bowls or add it all to the pot. Put a heaping spoonful of pico de gallo and avocado chunks/guacamole in each individual bowl and ladle soup on top. Squeeze lime on top and sprinkle with corn tortilla chips and fresh cilantro, if desired. Oh my! It has been such a miserable winter in the East this year, I have craved soup, soup, soup and more hot warming soup. This recipe really hit the spot. Not just the same ole chicken soup. The jalapeño gives it a second layer of heat that was perfect. The avacado’s creaminess rescued my tongue and the lime gave it pop. Great recipe! What a quick and easy dinner! I threw this together tonight… literally decided to make it at 3 pm right before my shopping trip and it was on the table at 5:30! Kids loved it. Husband isn’t home yet but I know he will too. Delicious. The lime puts it over the top. Thanks again for a wonderful, healthy meal for the family. This is one of my favorite soups ever. It’s the perfect way for me to use my boiled chicken from my stock and it makes the most delicious dinner. I’m obsessed. I’ve made it five weeks in a row with the abundance of carrots and cilantro I have from my CSA. It’s a perfect recipe! I am in the process of making this soup. So far, so good. I wasn’t sure if I am suppose to keep the liquid leftover from poaching the chicken and add that to the 8 cups of chicken stock. What is your opinion on that? Nope, you don’t save it for the soup, but you can save it and add more water and some boney chicken parts and make stock from the poaching liquid. It will be a little saltier than normal stock, though. This was so good! My husband loved it and he is even picker than your son! So nice when the picky ones like something! I just made this last night and it was delicious. My kids also loved it which is an added bonus which will inspire me to make it regularly for my family. Thanks for sharing! Great news, Carol! There are so many ways to play around with the recipe once you’ve introduced it to your family. Thanks for leaving a comment! 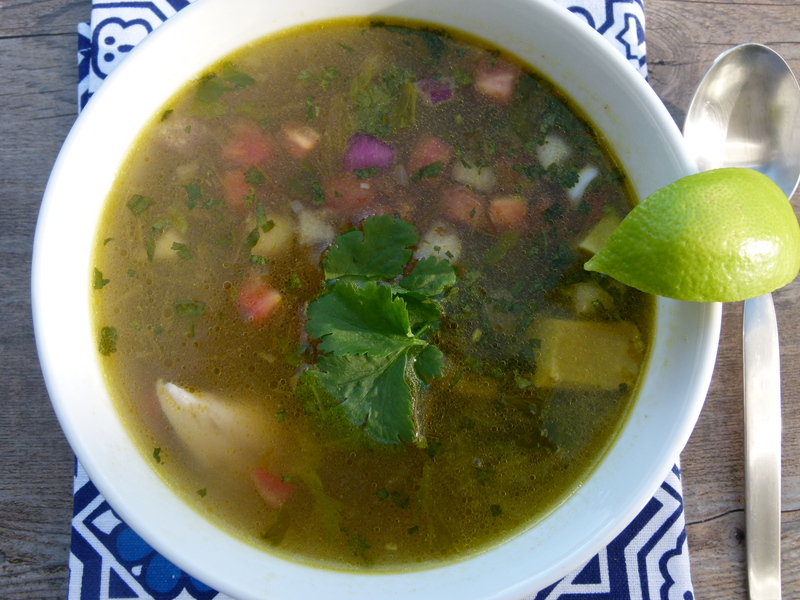 It is one of my favorite soups and I have always wanted to know how to make it! You both need to try it. Andrea, would love to hear what you think after you make it! Oh yum. This looks fantastic!